Always have your area rugs taken out of the home and cleaned by a professional company that specializes in Oriental and Persian rug cleaning. Note: If the cleaning company does not know what type of rug you have or the fiber content, they probably know very little about cleaning area rugs. 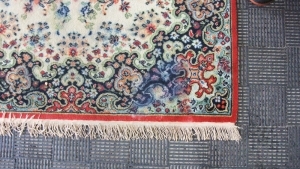 Rugs used in heavily trafficked areas, such as an entry hall, may need to be cleaned every year. Because some rugs are thick, waiting too long between cleanings makes the deeply embedded soil impossible to remove completely. Moths can be found in rooms that are seldom used in dark spaces under furniture and they are more likely to attack wool rugs that are dirty. Vacuum Rugs Regularly. 80 percent of soil in rugs is dry particulate matter. This matter acts as sandpaper and wears out the rug. Again, beware of any rug seller who tells you that the rug you have just bought from them should not be cleaned. What this really means is that their rug will not withstand cleaning due to condition, foundation “painting”, or other hidden defects. 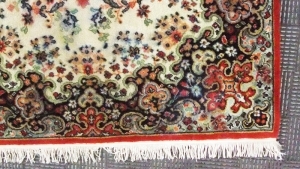 Visit our“Tips and How To” section for help treating stains in your oriental or persian rug. Contact us to set up an appointment or get a free quote to take care of your precious rug.